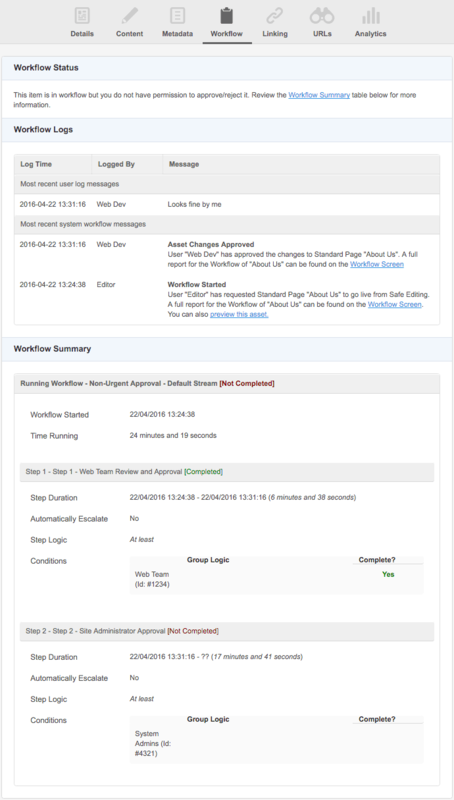 The Workflow screen displays the currently running workflow on an asset, allowing users who are part of the approval process to approve or reject any changes that have been made. Tip: A Workflow Schema must be applied to an asset in the backend for Workflow to run on an asset. For more information on how to create a Workflow Schema, refer to the Workflow Schemas manual. Please note that the options on the Workflow screen are similar to those on the Workflow screen of a Standard Page in the backend. For more information, refer to the Workflow Screen chapter in the Asset Screens Manual. This section displays the current status of workflow for the asset. If workflow is not currently being run for the asset, this section will display the message Not currently in workflow. To start the approval process, on the Details screen, select Apply For Approval in the Status field and click the Save button. The Workflow screen will be updated to show that Workflow is currently running, as shown in the figure below. In the figure above, the user is not a part of the workflow approval process, as indicated by the message in the Workflow Status section. When a user is a part of the approval process, fields will appear in this section, allowing the user to approve or reject the changes made to the asset, as shown in the figure below. 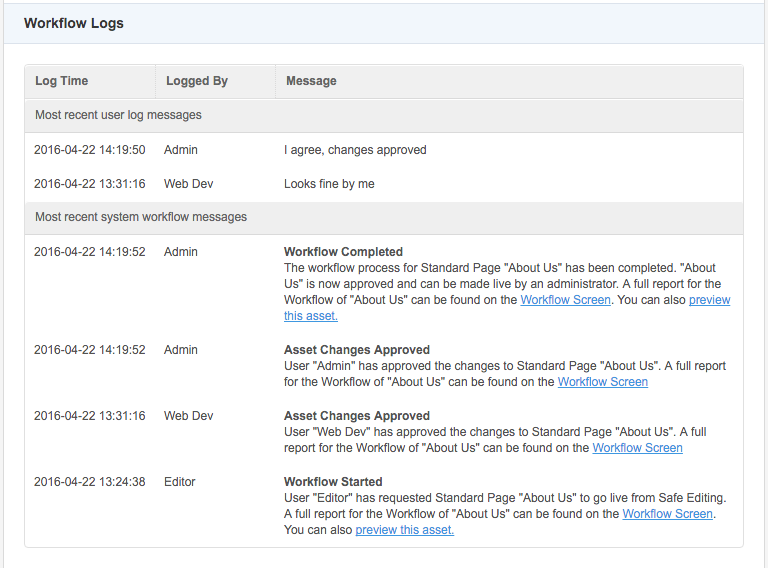 This section displays the latest set of user and system workflow messages that are logged for the asset. For example, in the figure below, the Workflow Logs indicate that Editor started the approval process for the asset. The changes made to the asset were then approved by both Web Dev and Admin. These users have also left messages regarding their approvals. 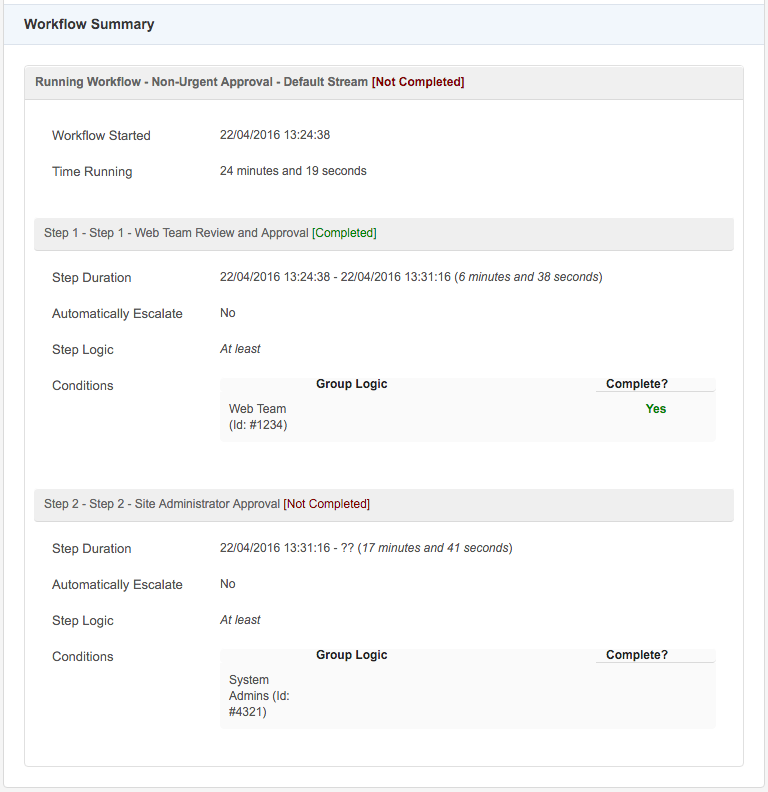 This section displays the progress of the workflow approval process, including the length of time workflow has been running and the workflow steps that need completing. If workflow is not currently being run for the asset, this section will display the message Not currently in workflow. In the figure below, the Urgent Approval workflow is being run on the asset. This Workflow Schema has been running for 11 minutes and contains two Workflow Steps: Web Team Review and Approval and Site Administrator Approval. The first step of the Workflow Schema has been completed, while the second is yet to be approved.